The Lister compressor, also referred to (by Beck) as a 'screw live box,' was first manufactured by James Smith. It is a compressor with springs to apply greater pressure than that of the gravity compressors. It consists of a bottom brass plate, with a cylinder permanently erected upon it; at the top of this cylinder is permanently mounted the bottom glass surface, just like a live-box. The difference though is that the outside of this cylinder is threaded and a large knurled ring rides in these threads. 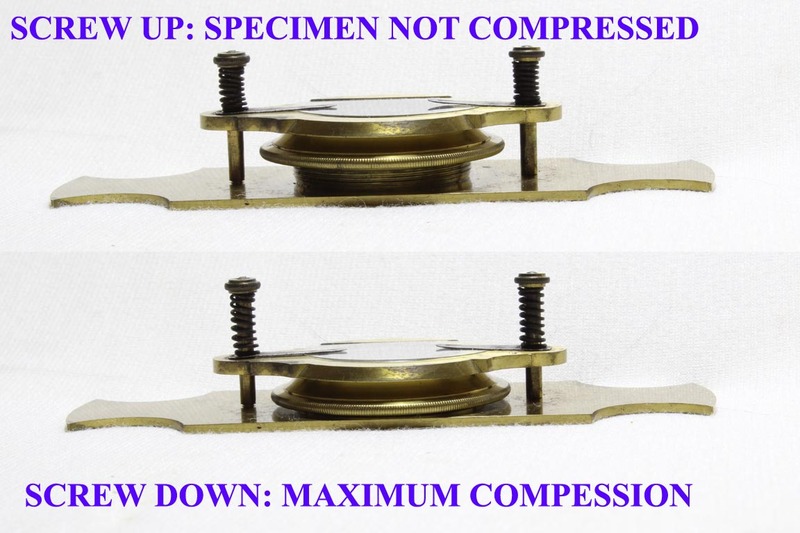 The top plate of the compressor rides on two upright posts, with springs applying downward pressure against the knurled ring on the bottom plate cylinder. If the knurled ring is screwed all the way down, the glass in the top plate is pressed against the glass at the top of the cylinder with the full force of the springs. If the knurled ring is unscrewed, it pushes up on the top plate, lifting it off the bottom glass. The glass on the bottom part has beveled edges. There are two steel tabs on top of the top plate to hold a cover slip in place. When the ring is unscrewed, it pushes up on the top plate, and when screwed down, it allows the top plate, pushed down by the springs, to compress the specimen upon the bottom glass support. In effect this allows a fine degree of adjustment to the degree of compression, which is more forceful than the gravity types due to the springs. In use, the knurled ring is unscrewed all the way up with no cover slip on the top plate. The specimen is then placed on the glass at the top of the cylinder of the bottom plate; once the specimen is in place, a cover slip is placed under the two steel clips of the top plate, and the knurled ring is slowly screwed down until the desired degree of compression is achieved. The top plate has a straight edge against which a coverslip with one flat edge can register. The Lister compressor was made and sold by James Smith no later than 1840, continued to be sold by his successors and was still offered in the 1891 catalog of James Swift & Son. Ross also made a variation of the Lister compressorium, with four instead of two upright posts.